This delicious recipe is an old family favorite. It's like a Reese's peanut butter cup, but better, and better for you, since it has dates and dark chocolate. 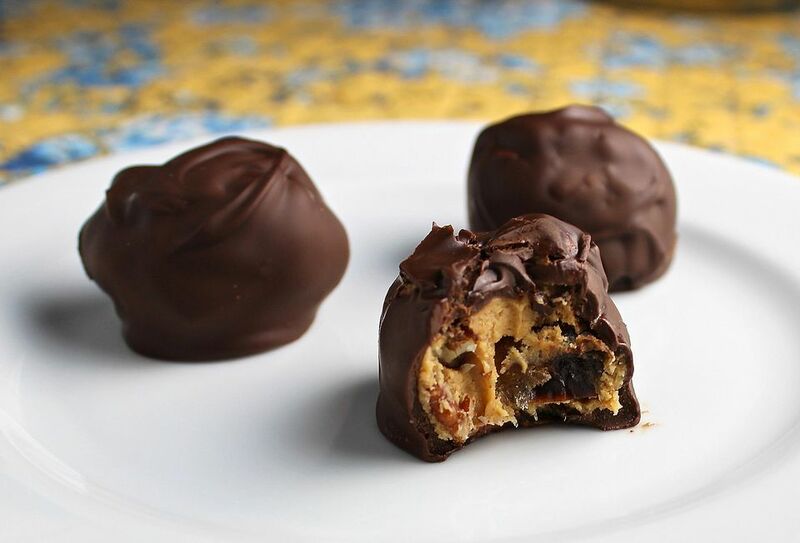 You bite into a smooth and creamy but firm chocolate coating to a velvety peanut butter filling full of dried fruit and nuts. Store these little candies at room temperature, tightly covered, but you can refrigerate them if you'd like. At room temperature, the chocolate is solid enough to pick up, but it melds very well with the peanut butter filling, so the two are almost the same texture. In the old days, people used to use a square of paraffin (which is edible) and melted it with the chocolate so it firmed up as it cooled, but it's unnecessary. In a large bowl, combine the peanut butter, peanuts, powdered sugar, dates, and butter and mix well; form into 1 inch balls. Place on waxed paper lined cookie sheet and chill until firm. Melt the semisweet chips and the chopped bittersweet chocolate together in a 2 cup glass measuring cup in microwave on medium power about 2 minutes, stirring once, until the chocolate is almost but not quite melted. Remove the chocolate mixture from the microwave oven and stir continuously until it is melted and smooth. This helps temper the chocolate by seeding it with crystals so the chocolate is fairly firm at room temperature. If you use medium power and stir once, the chocolate will not burn. Dip each ball into melted chocolate mixture and set on parchment paper. Let stand until chocolate is firm, then store tightly covered at room temperature. To dip the candies, make sure they are well chilled first. Melt the chocolate in a glass measuring cup so the chocolate is deep enough to work with easily. Drop the bonbons, one at a time, into the chocolate. Use a fork to gently turn them, then fish out the bonbon with the fork. Tap the fork on the side of the measuring cup to remove excess chocolate. Tip the coated bonbon back onto the waxed paper. Use a bit of the melted chocolate to fill in any holes or fork marks, if necessary. Take your time; this is a contemplative task! The chocolate should firm up in about an hour.